Harry Giles is a professional basketball player who turns up for the Sacramento Kings of the National Basketball Association (NBA). The Kings selected him in the first round of the 2017 NBA draft. On the court, Harry takes up the playing position of power forward or center. Giles is still quite young but is already making his mark in basketball’s most renowned league. We take a deeper look into who Harry Giles is along with other facts. 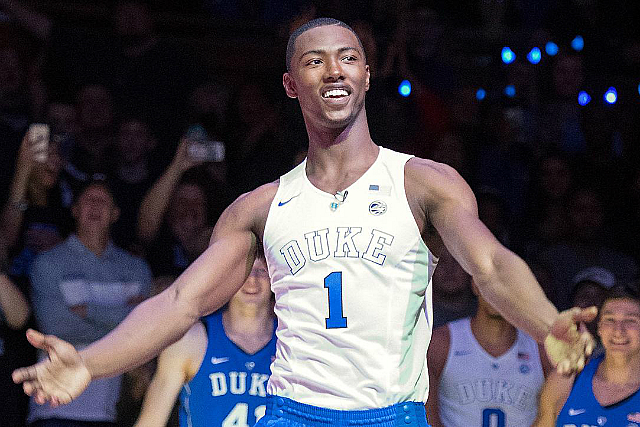 Who Is Harry Giles, the NBA star? Harry Giles was born on the 22nd of April, 1998 in Winston-Salem, North Carolina. He was born to his parents, Harry Giles Jr. and Melissa Addison Giles. You can describe him as one who took after his father as he is playing basketball just like his father did while at Winston-Salem State University. When it was time for high school, Giles attended the Wesleyan Christian Academy in High Point, North Carolina where he spent three years. While he was with them, he played with the school basketball team. In his freshman year, he was averaging 12.5 points and 9.5 rebounds per game. In that first year, Wesleyan Christian won the 2013 NCISSA 3A State Championship. The next year was not successful on the court as Giles had to sit out the entire year due to an injury to his left knee. By the time he returned to the court in his junior year, Wesleyan was ranked by USA Today as the No.2 team in the country. In only his second game after his year-long absence, Giles scored a career-high 38 points while also grabbing 19 rebounds as well. He also helped Wesleyan orchestrate a run that was primed to end with the Trojans lifting the championship. In that run, Giles chipped in with points scored and rebounds as Wesleyan Christian recorded victories over schools like the Word of God Christian Academy, Orangeville Prep, amongst others. Wesleyan Christian did, however, lose the NCISAA 3A state championship to Greensboro Day School but had an impressive win-loss rate of 30 -5. Giles as an individual, averaged 23.9 points, 12.5 rebounds, 2.0 assist and 3.0 blocks per game during that season. By the time he was to move on to his senior year, Giles decided to change schools and ended up at Oak Hill Academy in Mouth of Wilson, Virginia. Another knee injury disrupted his time at Oak Hill and he had to move to Forest Trail Academy in Kernersville, North Carolina where he took online courses to help him wrap up his senior year. With a host of options to pick from when it came to selection for college, Giles opted to commit to Duke University and made his debut on December 19, 2016, in a win over Tennessee State. His first college career double-double came in a win over Georgia Tech where he scored 10 points and 12 rebounds. At the end of his freshman year wherein he played a total of 26 games, Giles averaged 3.9 points, 3.9 rebounds and .4 assist per game. He did only start 6 games that year. He decided to forego his final three college years and entered the 2017 NBA Draft. Harry Giles was selected as the 20th overall pick by the Portland Trail Blazers but later had his rights traded to the Sacramento Kings. He signed his rookie deal on July 8, 2017, and it was later announced that an injury had him sidelined till the turn of the year. When 2018 rolled around, Giles was prevented from seeing action but asked to focus on training and injury prevention. Giles took part in the 2018 NBA Summer League with the Sacramento Kings and on his debut, he scored 17 points, 8 rebounds and 5 steals in a game against the Phoenix Suns. Aside from playing for his previous school teams and his professional outfit, Giles has also been able to appear and represent his country, all be it, at age-grade level. He played for Team USA in the 2015 FIBA Under-19 World Cup held in Greece. With an average of 26.4, he came third on points, second in offensive rebound percentage with 17.1 and first in defensive rebounding percentage with 28.7. Giles was named to the All-Tournament Team as well. Harry Giles stands at a height of 6 foot 10 inches and weighs in at 240 pounds. Aside from playing basketball for Winston-Salem State University, Giles’ father also played football as well. Giles has won the Jordan Brand Classic and Nike Hoop Summit awards in 2016.